So, it came up on twitter that tips on how to draft would be appreciated and perhaps of interest to people. I’ve been doing drafts for a long time, cause I am old and started young, so I’m sharing what I know in the hopes it is helpful! Warning: I am doing this fast and so it may ramble even more than my average post, if such a thing is possible. Notice how big a difference there is between top and bottom? If you get one of the best rucks, you are starting out with a big edge. Now lets looks at some made up defenders. We need 54, so I am going to group them for ease of reading. The person who gets the 18th worst defender is 20 points behind the person who gets the best one. The person who gets the 10th best defender is 15 points behind the guy who got the top one. For the rucks the 18th ruck is 70 points off, and the 10th is 55 points worse off. If I had the choice between taking the 110 defender and the 100 ruck, I would go for the ruck. If you pick too late to get one of the top rucks in this example, then the gap between who you get if you took a ruck next and the spots below is less. That’s when it is time to look at the gaps in the other positions. You want to take the player who will give you the most points when combined with the players you will get in the later rounds. If there are three forward left who are a good ways above the rest of the forwards poo, then take one of those. If you do not yet have a captain then definitely take one of those. Oh, since your captain is worth double points, don’t forget to factor than in when calculating gaps. A ruck captain is super valuable, which is why Grundy and Gawn should be very top pick in every draft. Danger is also way valuable for being better than any other forward and a captain option. Back to who to take, another part of maximizing the gaps is, when there are a bunch of players left with the same value in the same position, to take one of those players as late as possible. If, for example, someone drafts the first 70 point ruck in Round 8 and you draft the other 70 point ruck in round 10, you are ahead. If there are only 60 point rucks left you might as well wait until your last pick to take the last one. BUT if you try that, some bloke will end up taking him as a backup, in which case you could end up with a ruck even lower than 60. If at the end of the daft there are a pile of cheap players available as backups or 3rd starters at some positions, take players from the other positions, so you do not get left out. You want to wait as long as you can, but some managers really like backups. Also, some managers will take a guy they cannot start at the beginning of the season, and actually need more than the minimum at each position. If someone takes Mumford, who do they play until he is available? Now there is a need for 19 rucks, and if you plan on getting # 18, well, you might not. In theory if we knew the averages of all the players, we could calculate a perfect draft order. Of course we do not and there are also wrinkles like injury and suspension to take into account. I mentioned Mumford. At some point he is better than a worse ruck who plays every match. Andrew Gaff will go lower than he would if available R1, but how much lower? Buddy, who knows when he gets back, but still, valuable. Often you can grab an injured gun and use a backup for a while. When do you take breakout players? Jack Steele might go close to what someone thinks he will score, but he may also go after that. Such things are where the drafting gets interesting.and not mechanical When you get to backups, you can grab much longer shots if they have some job security. While not my most important pick, the picks I felt best at in my own draft were Tom Liberatore at pick 76 and Dan Houston at pick 220, because for when I got them, they had good value. It is also possible to take say more players than you need all who are meh at the same position, and then play them based on the matchups each week. Cna be a way to deal with getting locked out of a position. Or just to handle the last spot in a position. There is also some psychology in drafting. There are these things called “Runs” where people all start taking the best player left in a position in a row. Expect to see that with rucks. It can happen to any position if there is a drop off ahead. If there are 6 good defenders left, and there are 8 people drafting before you, it can happen that all 6 will go before it is your go. That is very annoying, and also hard because you have to adjust with little time. If you know who every other drafter barracks for, that can help. People often default to a player from their team when stuck. If you can prep it helps a lot. List who you like so if an auto pick happens you are not screwed. Do not end up with Tom Mitchel as your first pick. Know who all the rucks are. Know who the top number of players needed in a position x the number of managers in your draft are for the other positions. For sure know who you would take for the first 5 round. Seriously, five rounds. Know when you are willing to give up on getting a good ruck and settle for a not good one, and then know when you will want to pump back in to get a decent one instead of a bad one. If you have a pick near either end of the draft, pay very close attention to the teams who are closer to the end then you, so you know who it is safe to leave and who it is not when you have two players you want about the same. If for example, you are #3, and #1 and #2 took Gawn and Grundy, on round 2 if you want a ruck and another player, you can safely take the other player since #1 and #2 are not going to take a second ruck with their second pick. Well, unless they are the kind of hoser who would do that and then try to trade him. That is a very risky plan though, and more likely to backfire than just taking the best available players. And, you can take players with the intent to trade, if you are that sort of hoser and you are sure you can get away with it. I feel it is a bad risk, but that’s just me. Finally, remember the words of Douglas Adams. “Don’t Panic.” Stay calm, think, and don’t freak out when your plans are totally ruined by the three guys picking ahead of you, which is going to happen. Okay, I hope that was helpful. I extra encourage people to add advice in the comments! Have I already missed the draft comps? Just stumbled upon them after 3 years of SC and they look like fun. As far as overall drafting strategy goes, I spent a fair amount of time thinking about this before our recent draft. 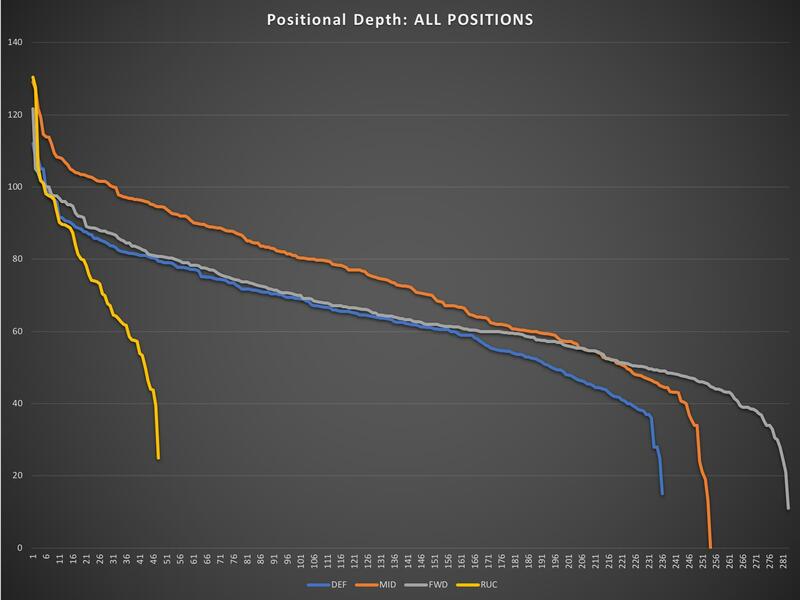 After looking into the relative depth of each position’s pool, I ran some simulations to see if there was an optimal strategy as far as when to take players from various positions. I turned out that yes, prioritizing different positions produced big sizeable variations in expected output, but that very few combinations out-performed what computer scientists would call a ‘greedy algorithm’: just taking the best available player at every pick, subject to eventually meeting all positional requirements. 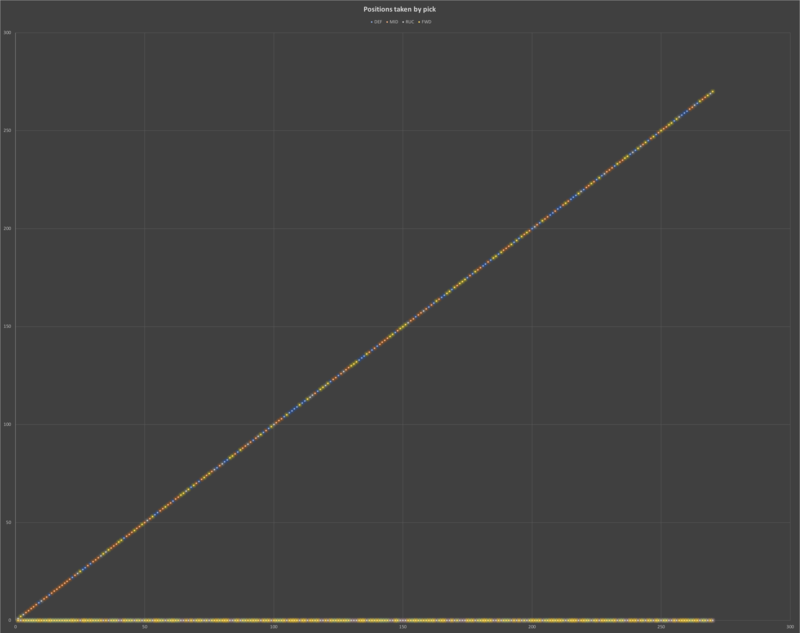 Of the 1000 random combinations I tested, the greedy algorithm did better than all but 40-something of them, and the spread between it and the higher-performing combinations was only a few points per week. On draft night, I basically followed that strategy, although I did use positional depth as a tie-breaker – for my first pick, for example, I had Jake Lloyd and Lachie Neale roughly equal on my draft board, so went with the defender (although had I known how many in advance how many defenders I was going to end up with later, and how comparatively thin my midfield would end up being, I would have done the reverse). I’ll second the advice about getting your draft order into the system in advance in case there are technical issues – not doing so is why I ended up with Shaun Higgins in the third round, so that’s a big lesson for next time. I did put a fair bit of work into my draft order in advance, but, foolishly, it stayed in Excel. Each player was assigned a ‘draft value’, which was based on their expected average, plus or minus points for certain modifiers. The expected output was based initially on a player’s average from last year, or their price if they didn’t play last year, but I went and manually overrode a good chunk of them. As to the modifiers, players lost points for being injury/suspension prone, or if my expectation of their output was highly speculative, or if they were slated to miss the first X number of weeks, or if they had shaky job or role security. Players gained points if they were notably durable. I didn’t bother adding modifiers for positional depth, although if you want to take a positional-depth oriented strategy into the draft, doing so could be worthwhile. Another thing my simulations revealed was that accurately predicting each player’s output was much more important than draft strategy – my simulations assumed that everyone drafted more-or-less optimally (which won’t happen in real life), and even the worst-performing strategy outperformed most of the coaches in our draft from last year. One other thing I noticed in my simulations is that in a snake draft, the advantage of having an early first pick rather than a later one is minimal. 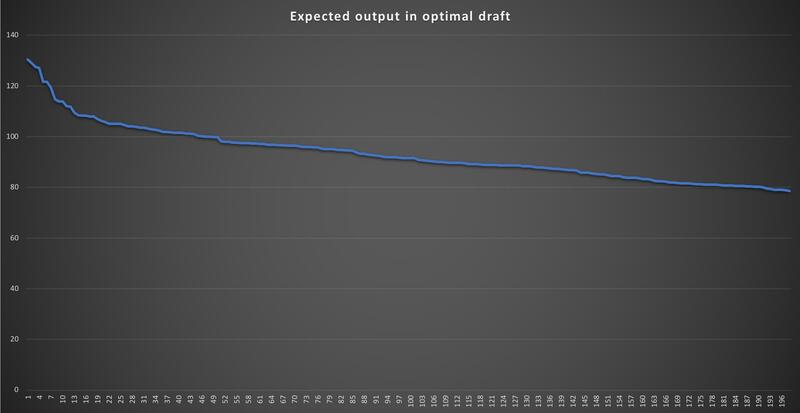 In an optimal draft it does exist, but it’s so small that in a real-life, non-optimal draft it’s likely to have no real effect whatsoever. Thanks for the thoughts FD. Long time SC but first time drafting this year. Much appreciated.